Two days after receiving the violets I noticed two of the three blooms are wilted. I suppose that was supposed to happen…right?? I mean, flowers wilt. I didn’t think it was noteworthy so I didnt get a picture. Also, I figured it was the beginning of their demise in my care. This morning I woke up to find one of the cats playing with something. Upon inspection I discovered it was a leaf from the violets. *sigh* As if I needed help killing them. I figured they ate the violet and wondered if they’re poisonous. But, when I checked, they hadn’t eaten it. Secretly, I wish they had destroyed it. Then the death of the violets would not be my fault…not directly anyway. Since we moved into our house 14 months ago, I have killed a total of four plants. Plants just don’t survive in my care. As a housewarming gift, my mother gave us three plants, each of which was a clipping from her garden: dwarf roses (with sentimental value), an aloe plant, and a plant called “mother in law” because it apparently cannot be killed. Of course, the mother in law plant did not make it for long in my care. The roses didn’t make it either. And, let’s face it, aloe is really hard to kill. I feel pretty guilty about killing the plants that my mom gave to us, and I hated telling my mom that they didn’t survive my care. I’m actually impressed by the hardiness of the aloe plant, in general. It looked a little rough so I decided to transplant it into a bigger pot. Some soil, a little water…and I haven’t touched it since! And it looks pretty good. Next, my parents brought us an oak tree sapling from one of their trees. Oak trees hold a special place with me because I grew up with them at my parents’ house. You know when people ask “what kind of tree would you be and why?” For me it would be a live oak because they’re so hardy. They withstand hurricanes (if trimmed and taken care of), and they are beautiful…especially with spanish moss in their branches. The sapling actually sprouted from an acorn that one of their trees dropped…and it landed and grew in a pot that they had nearby. It was almost like it was meant to be for us. After the tree sat in its pot for a few months, it looked a little rough. It had been drowned by a big rain, and I watered it when it looked rough. I even gave it fertilizer. Then, we decided to plant it in our backyard. And there it stands today. But, fortunately for the tree, it doesn’t really require my care and attention. Next, I saw ranunculus plants for sale at the supermarket, and I decided I HAD to have one. They are my favorite flower, and were my #1 flower choice for my bridal bouquet…but they weren’t in season when we got married. I was so excited to have my very own ranunculus plant. And then I killed it. The directions say 6 hours direct sunlight and to water ever few days. So, I may have forgotten to water…but it was out near the sprinklers..? It withered and died. And I was bummed. Frustrated, I threw it away and began to come to terms with my non-green thumbs. I was prepared to never attempt to take care of a plant again. And then I was given one at work yesterday. Crap. 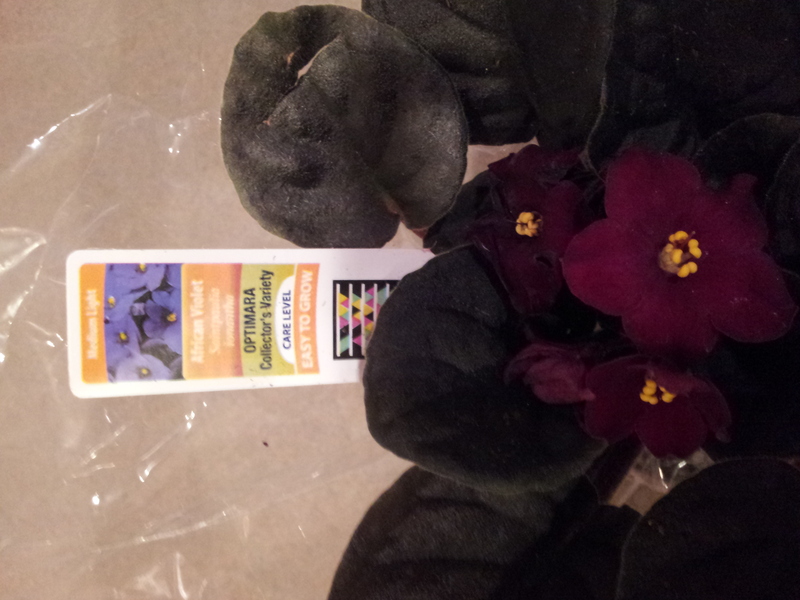 And African Violets, of all the damn high maintenance plants! Partial sunlight, and special fertilizer/food and all. Psh. …and the label says “Easy to Grow” for what they call “care level.” Ha. We’ll see about that. I’m afraid the violet is doomed.